Cheryl West has been living in her home for 60 years. Her family bought it when she was eight years old. It’s near the historic Boston-Edison neighborhood in Detroit. But she lost it to tax foreclosure before she learned all her options. Cheryl West lost her home to tax foreclosure. Afterward she learned she had been eligible for a poverty exemption. 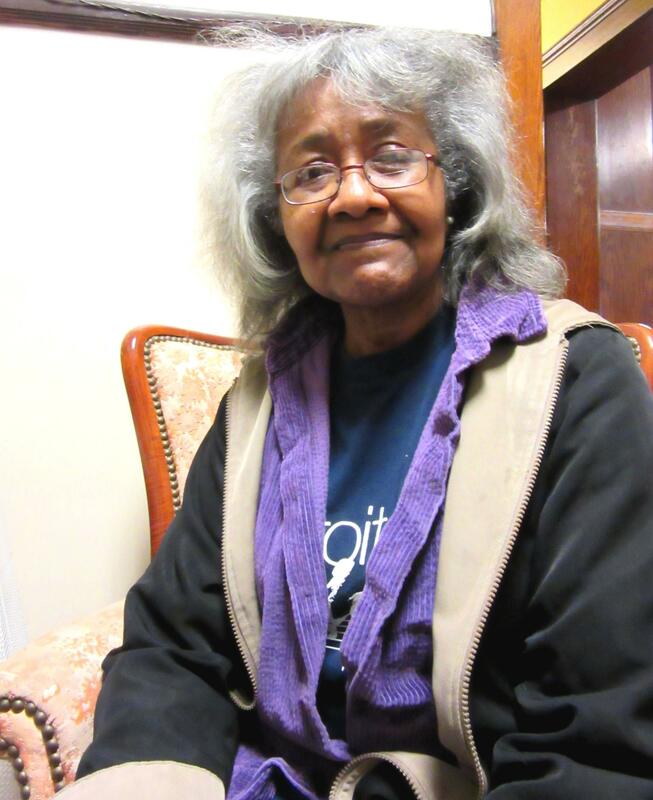 “The house had already gone for eviction, that I was to be evicted from the home. By that point it had gone for auction,” she explained. She now rents the house, but she suspects the landlord will evict her and move into it. All indications are that West never should have lost the house. She lives on her Social Security check. People with incomes near poverty can get a poverty exemption on their taxes. “I found out at the very end zone that, in fact, I should have been eligible for the exemption for property taxes and no one told me that," she said. And advocates say a lot of people lose their homes because they don’t know they can challenge their property tax assessment. David Mitchell is a member of the group Detroit Eviction Defense. He says as property values have plummeted, tax bills should have gone down too. “It’s the county that has never reassessed these properties, that is charging people for thousands of dollars over what their actual taxes should be and saying, ‘Oh, we messed up? That’s too bad. You’ve still got to pay or you’ve got to leave your house’” Mitchell said. Detroit Eviction Defense has been calling for a moratorium on tax foreclosures. Wayne County Treasurer Raymond Wojtowicz says he can’t do that. “It isn’t within our authority. It’s a higher public service organization, legislative specifically, that can only attain that goal for those people,” Wojtowicz said. 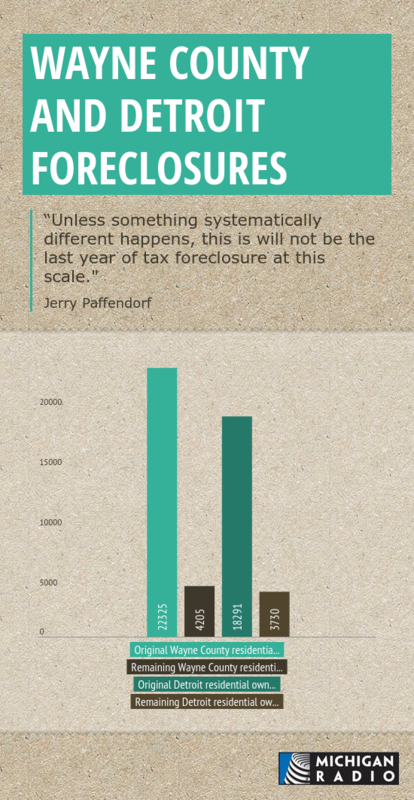 Far fewer residential owner-occupied properties are facing foreclosure than were at the beginning of the tax season. The remaining homeowners have until June 8th to make payment arrangements. The county treasurer’s office says there are many programs in place to help people, but it cannot retroactively adjust assessments and it cannot retroactively grant people a poverty exemption. That’s something homeowners have to do before foreclosure. Frank Alexander is a law professor at Emory University. He helped draft Michigan laws that help homeowners struggling with mortgage and tax foreclosures. He says more needs to be done to prevent foreclosures and keep people in their homes. “Michigan doesn’t have adequate circuit breakers to create exemptions for owner-occupied property, particularly the low income, low-to-moderate income owner-occupied property. They should not be paying significant property taxes," Alexander said. Changes to state law have helped some people avoid foreclosure, for now. 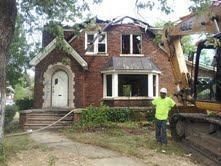 New low-interest payment plans have cut Wayne County’s foreclosure list from 22,000 owner occupied homes to 4200. More people still can make those kinds of arrangements if they get into the treasurer’s office before June 8th. But, there will still be a lot of families who’ll lose their homes, and this is not a one-time event. Jerry Paffendorf is with Loveland. It gathers data on property. “Unless something systematically different happens, this is will not be the last year of tax foreclosure at this scale. I think it’s important for people to understand this is not a solved problem because we’re flushing out the system, so to speak,” Paffendorf said. The Wayne County Treasurer’s office confirms next year could be just as bad. A Detroit-based technology firm says it has an elegant solution to the city's property tax-collection woes.